The East Haven Rotary Club provides “Service Above Self” to local, state, national and international communities, with events, such as, Thanksgiving Dinner Deliveries and the Clothe the Children campaign. 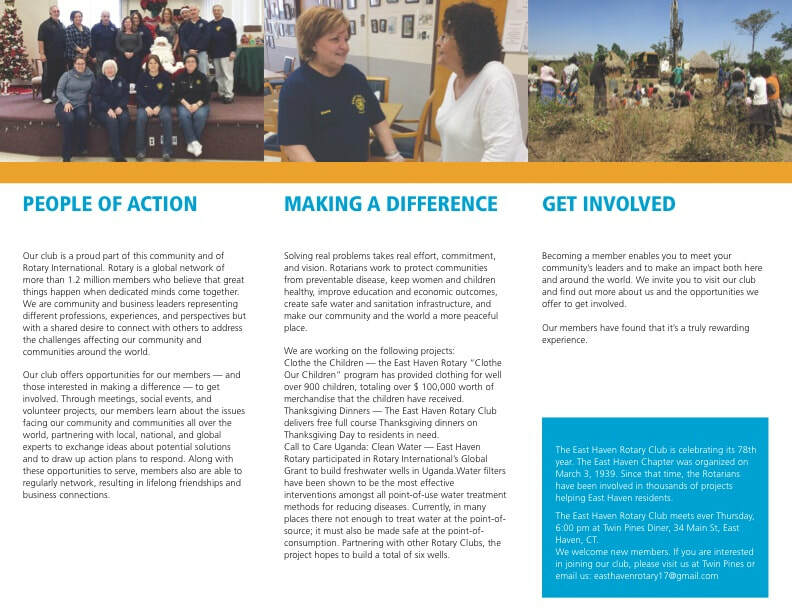 Founded in 1905, Rotary International is recognized as the world’s first volunteer service organization. Today there are more than 1.2 million Rotarians in 34,000 Rotary Clubs, located in 200 countries around the world. Rotary International’s motto “Service Above Self” is the guiding principle as we focus our efforts on providing service within our communities and throughout the world. Our participation in Rotary International’s Clean Water Initiative is one example. From the earliest days of the organization, Rotarians were concerned with promoting high ethical standards in their professional lives. One of the world’s most widely printed and quoted statements of business ethics is The 4-Way Test, which was created in 1932 by Rotarian Herbert J. Taylor (who later served as RI president) when he was asked to take charge of a company that was facing bankruptcy. This 24-word code of ethics for employees to follow in their business and professional lives became the guide for sales, production, advertising, and all relations with dealers and customers, and the survival of the company is credited to this simple philosophy. Adopted by Rotary in 1943, The 4-Way Test has been translated into more than a hundred languages and published in thousands of ways.